Below are our flight tracks for most of the flying days, along with NEXRAD weather RADAR. 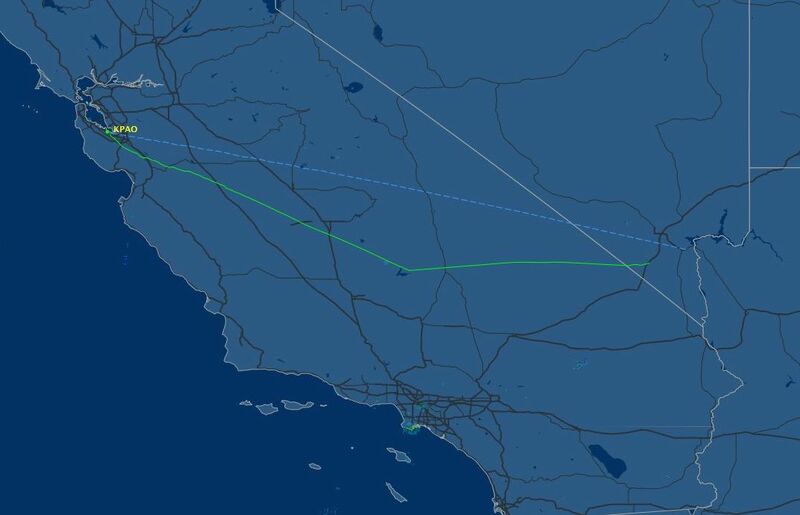 Our first leg was not captured by Flight Aware. It involved an IFR departure out of Palo Alto to get through the fog, but was clear the rest of the way to Logan. Our route of flight was PAO-LLC-LGU at 11,500. The next leg, from Logan to Ft. Collins Colorado, involved dealing with adverse weather the entire flight. 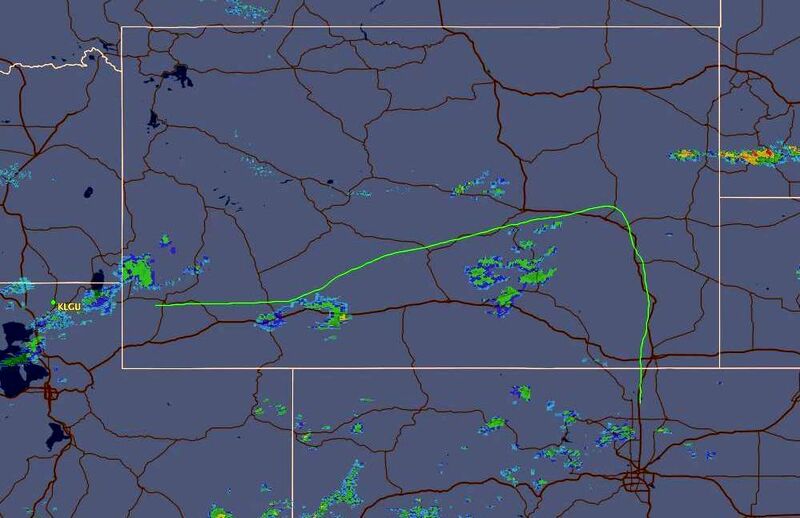 The planned route of flight was LGU-MBW-FNL but we had to divert well north of that route to avoid a line of nasty thunderstorms. About 30 minutes after we landed in Ft. Collins, a thunderstorm swept through delivering heavy rains, small hail, and high winds! The goal for today was to make it all the way to Ft. Lauderdale with two fuel stops. We knew that goal was pushing it and we were ready to abandon that goal if weather or fatigue might have impacted safety. The first look at national weather that morning dashed our hopes: there was a huge line of thunderstorms stretching from central Texas up through Indiana, requiring us to divert pretty far south of our original route. We made it to El Reno Oklahoma before the line of thunderstorms and stopped for lunch and fuel. 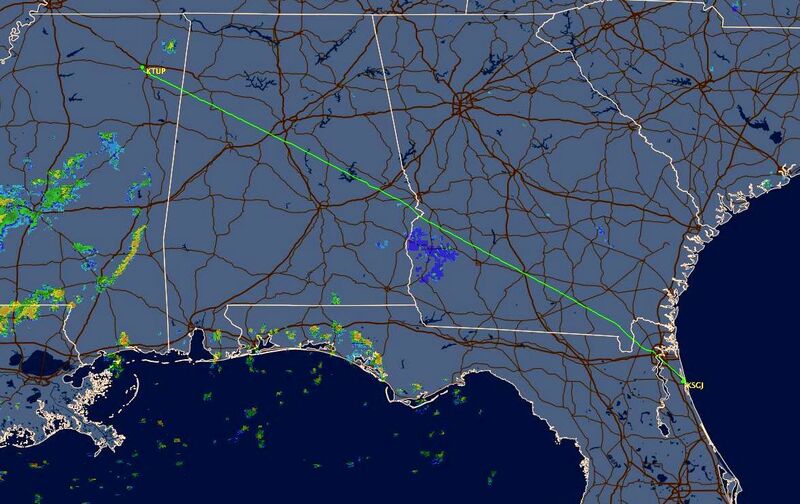 At this point, we realized we couldn't make it to Ft. Lauderdale that day due to another line of thunderstorms blocking us near northern Florida so we planned to spend the night in Alabama. We departed IFR and made our way through a gap in the thunderstorms using RADAR and ATC's help. As we got closer to Alabama however, RADAR showed a group of thunderstorms moving over our destination airport and so we elected to divert to Tupelo - birthplace of Elvis! 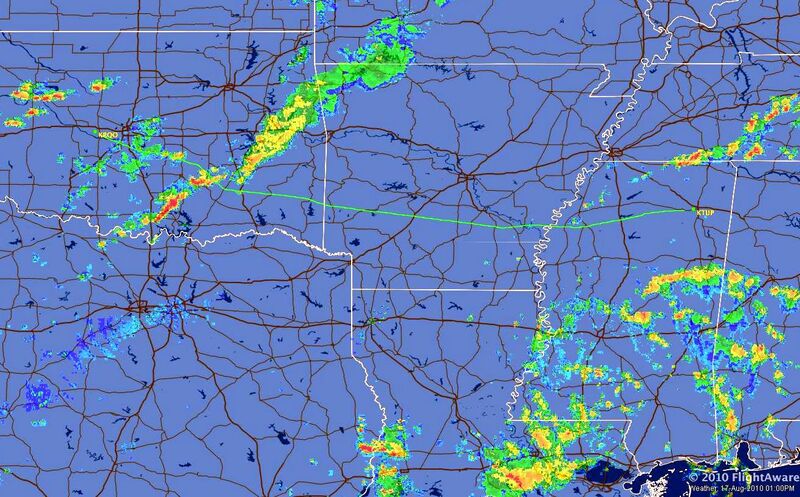 We woke up to a rainy and overcast day in Tupelo and thus departed IFR. There were thunderstorms in the vicinity but we turned on course and away from them shortly. We were in the clouds for only about 45 minutes before breaking into clear air between layers. We were cleared direct to our fuel stop in St. Augustine Florida. We refueled and had lunch and were anxious to get to Ft. Lauderdale before a presidential TFR went into effect, but the vacuum pump chose that time to fail. Fortunately, I carry a spare for just such occasions and had a local mechanic install it. 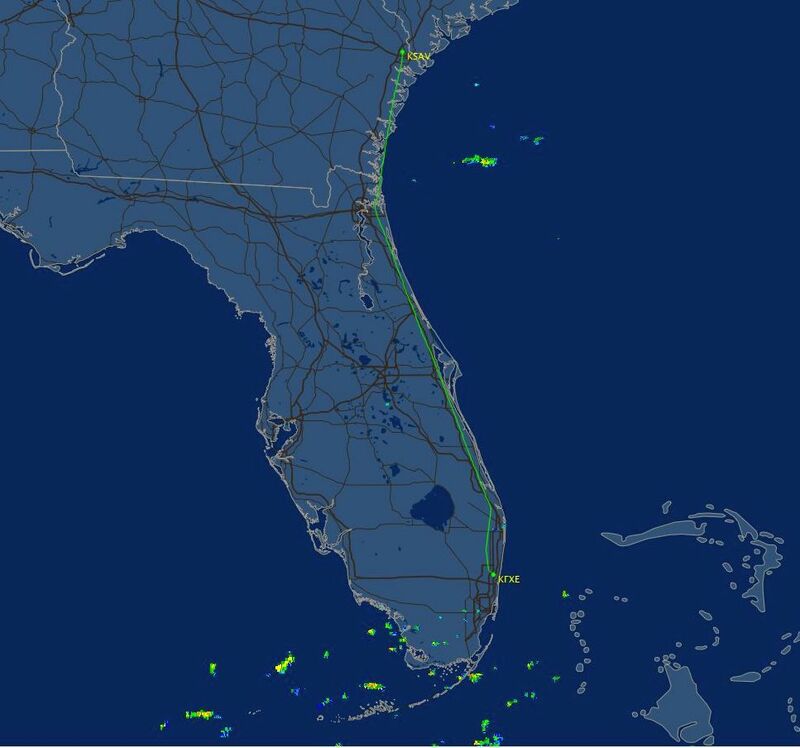 The IFR flight down the coast to Ft. Lauderdale was fairly routine. 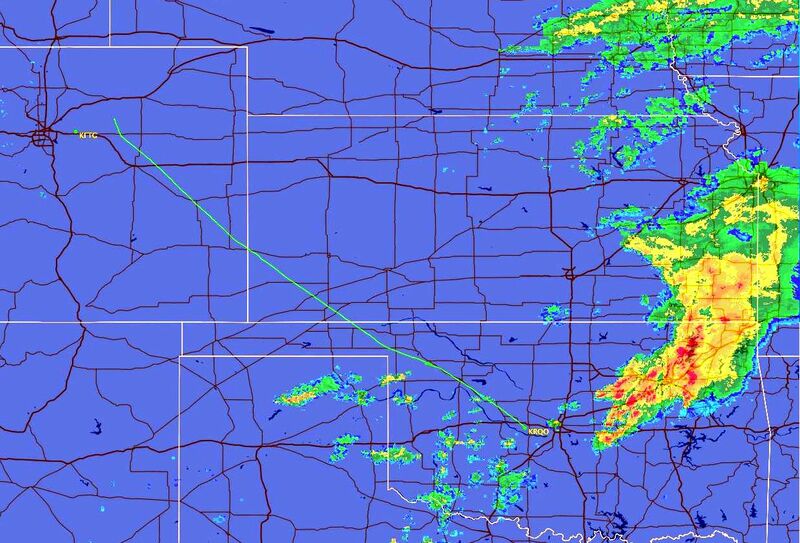 We had to divert east of course to avoid some thunderstorms. 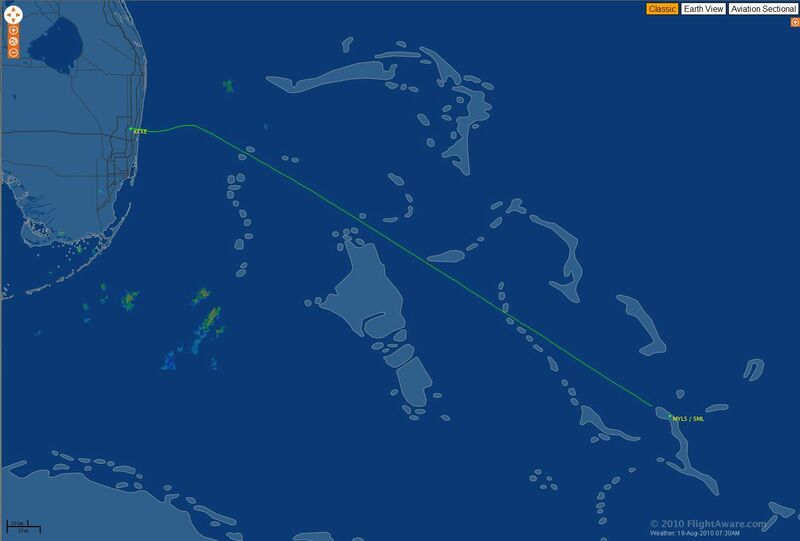 At another point, ATC rerouted us via Pahokee VOR. A glance at the RADAR showed a massive thunderstorm parked over Pahokee, so I replied "Unable Pahokee due to thunderstorms". I suggested another route, but they eventually cleared us back on our original route. 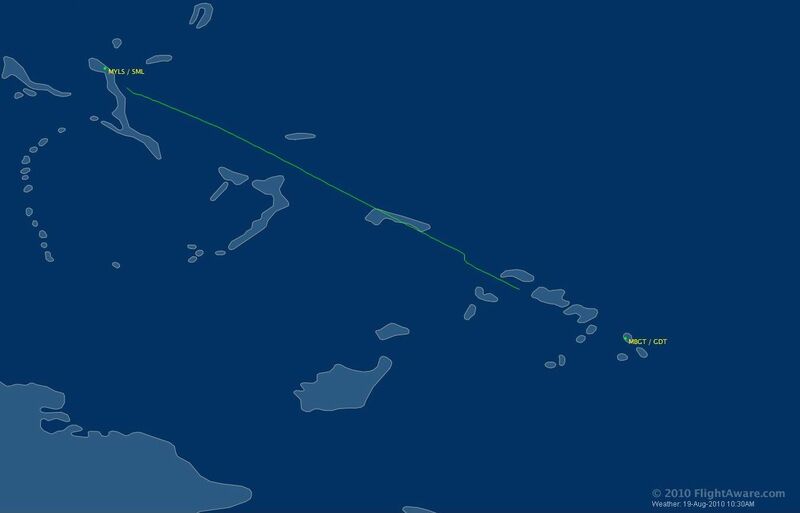 I filed two IFR flight plans - one from Ft. Lauderdale to our fuel stop at Stella Maris in the Bahamas, and another from Stella to Grand Turk. The first leg could have been conducted VFR: partly cloudy with scattered towering cumulus. The second leg gradually became IMC due to haze and clouds as we got closer to Grand Turk, requiring us to shoot the localizer approach. Glad we had approach plates! At about midway through the flight, around Mayaguana, we lost contact with ATC for about 30 minutes. The loss of contact and the unusual hazy conditions combined with being in the middle of the Bermuda Triangle made for a few uneasy laughs! This was a quick 30-minute hop flown at 2500'. Typical tropical weather: scattered cumulus and mostly sunny. Filing IFR in the islands is a bit different than at home: you can't file online or via FSS - you fill out a flight plan form and give it to the FBO, who then calls the tower and files it. 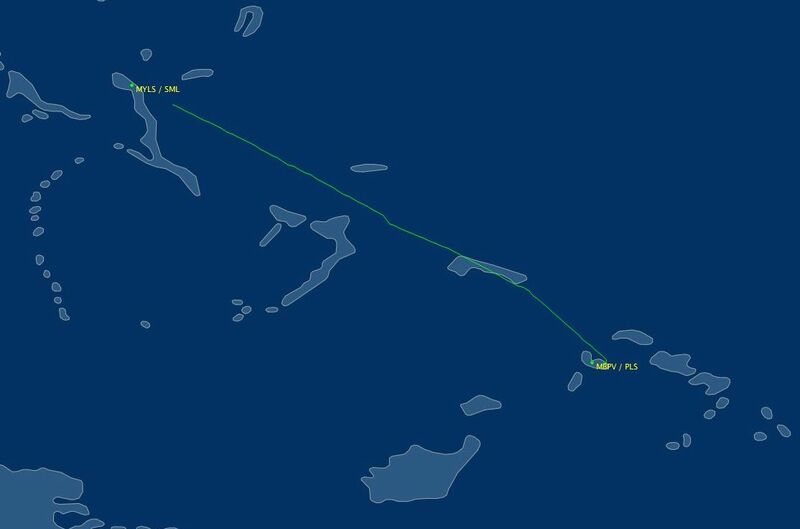 The flight from Provo to Stella Maris, our fuel and customs stop, was beautiful and mostly clear - and no communications problems this time! 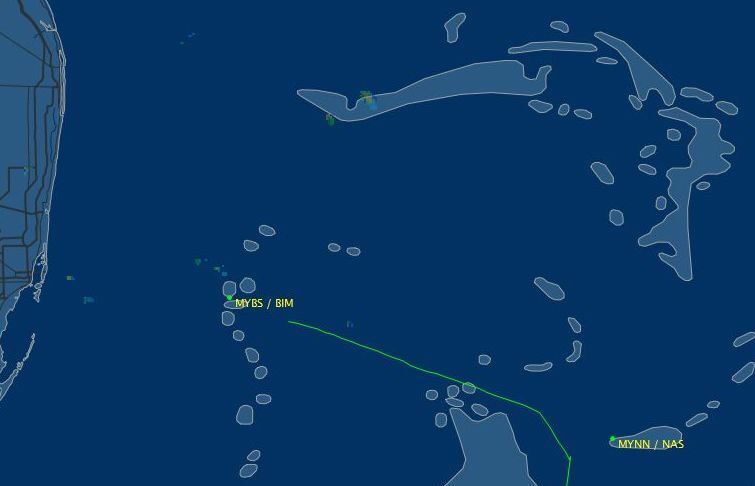 The short hop from Stella to Staniel Cay was a bit more cloudy, with clouds all along the Exuma island chain and thunderstorms just past Staniel Cay. More typical tropical weather today - scattered towering cumulus with bases around 2000'. 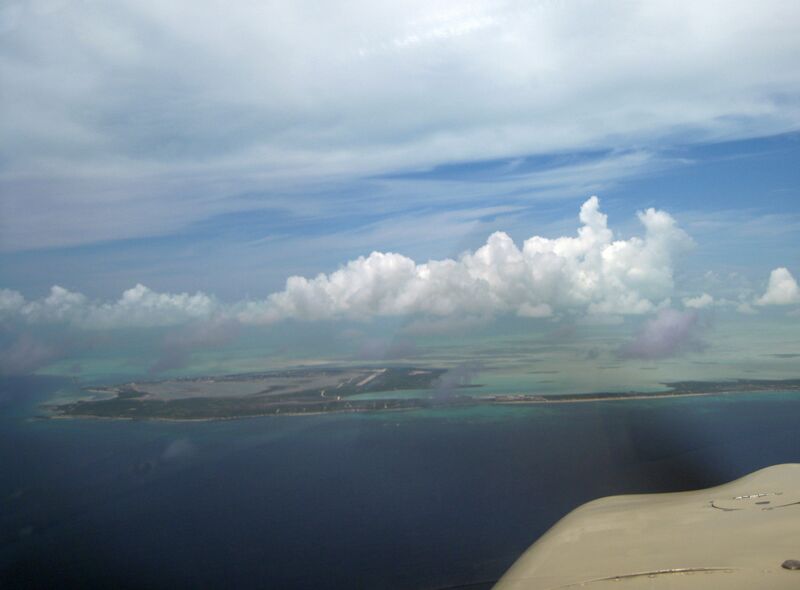 We flew VFR from Staniel Cay to a fuel stop in Nassau. As we were approaching Nassau, there were scattered thunderstorms around the island and an incoming commuter plane reported a waterspout to our left. We departed IFR for Bimini and had an uneventful flight aside from minor deviations for weather. The flight home from the islands was quick and easy. After departing from Bimini's uncontrolled strip, we headed north in a VFR climb while I picked up our IFR clearance from Miami Center. The weather was good - the usual cumulus clouds and a few cells here and there. This was a pretty easy flying day. I filed an IFR flight plan which pretty much followed the coastline to Savannah: FXE-PBI-VRB-OMN-CRG-SAV. We were mostly above the clouds on this leg. The radar image above doesn't show the huge hurricane off our right wing though! 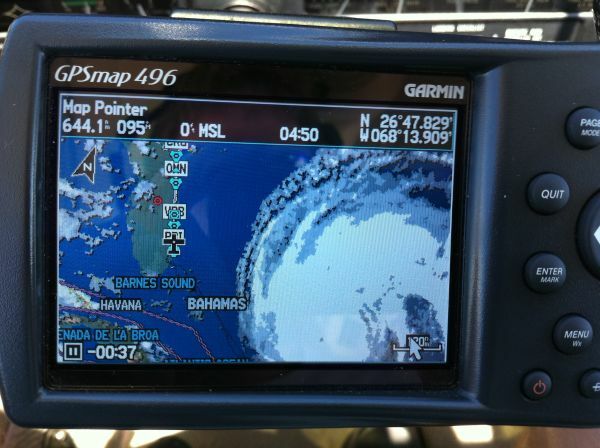 Fortunately, the hurricane stayed well enough offshore to not interfere with our visit to Savannah. 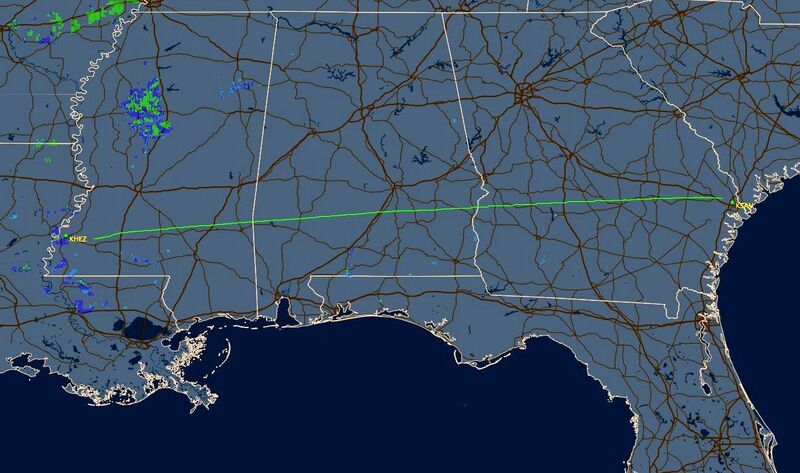 The flight to Natchez was uneventful, aside from the 20 knot headwinds! Another fine weather day. We flew from Natchez to Frederick Oklahoma for lunch and fuel, then to Santa Fe for an overnight stop. We were hounded by headwinds again today. The first leg was pretty smooth, but the second half of the second leg was quite turbulent. 13. 9/5/10: Santa Fe to Palo Alto - home! The first leg from Santa Fe to our fuel stop was gorgeous because of the incredible natural beauty of the high deserts. However, it was exhausting because of the non-stop turbulence! Approaching Nevada, one of the aerial tour pilots asked ATC about other reports of turbulence, and mentioned that several of his passengers had puked. I had planned to land in Boulder City for lunch and fuel, but on final approach into Boulder, the turbulence was so bad that I elected to abort and divert to Henderson Nevada. The last leg from Henderson to home was bumpy only for the first half hour then thankfully smoothed out. We flew past Death Valley, across China Lake and Lake Isabella then went direct home.